There’s no holding back the Internet of Things – this is where the world’s heading, and we’re already seeing it in concepts ranging from smart electricity meters to IBM’s rather more ambitious Smart Cities initiatives. The basic fundamental holding IoT together is connectivity, a world in which machines with intelligent sensors are hooked up to the web, and able to deliver a stream of constant data. But in order to do this most effectively, proper utilization of cloud computing will become a vital component. Ten years from now, things will be different. These days we wake up in the morning, jump in the shower, reach for the shower gel and only then do we realize the bottle’s empty. “Dammit”, you’ll curse to yourself before making a mental note to buy some more and hoping that you don’t forget. In the future, we won’t have to rely on ourselves to remember such trivial (but annoying) things, because everything will be automated. Your shower will already know about your washing habits, and most likely it’ll be able to tell you when the shower gel’s about to run out. There’ll be a sensor that can recognize the sounds you make when desperately squeezing the remaining dregs out of the bottle, and most likely that same sensor will pick up on your frustration too. But your shower will do more than just make a mental note for you. It’ll let you know exactly where to buy that shower gel by checking local store inventories for your favorite brand’s availability. It’ll also cross-reference your list of appointments that day to identify which is the most convenient store to drop by during the day. This “task” will automatically be filed, and synced with your laptop, smartphone, iPad or smart car to ensure you don’t forget. This is the future of the Internet of Things, but it won’t be made possible by a jumble of wires. What makes it possible is cloud computing, combined with the glut of sensors and applications all around you that collect, monitor and transfer data to where it’s needed. All of this information can be sent out or streamed to any number of devices and services, all update before you’ve even finished drying yourself off with the towel. Of course, this means that there’s going to be an awful lot of data flying around out there, data that needs to be processed quickly so that manufacturers, suppliers and everyone else in your shower gel’s supply chain can ensure that you never run out. The problem is exacerbated somewhat by the fact that you’re not the only out there taking a shower – think about, between 6am and 8am, how many millions of people are going through exactly the same routine as you are? Millions of them are busy scrubbing themselves clean, which means gigabytes of data streaming in from showers up and down the country. This is why the cloud is so important. 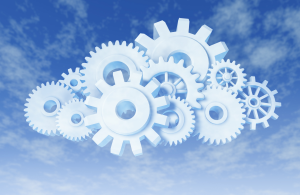 The cloud can easily get a handle on the speed and volume of the data that’s being received. It possesses the ability to ebb and flow according to demand, all the while remaining accessible anywhere from any device. But it’s not just you who needs this cloud. Manufacturers do too. In the shower gel example, there are lots of insights that can be gleaned from this, for example how long does it take the average person to get through a bottle of the stuff, will that person buy the same brand again, the same bottle size again, or does he or she prefer something different? Using these insights, retailers and manufacturers will come up with customized special offers for certain types of people, and deliver these to their smartphone in time for when they go shopping later that afternoon. Such insights can only be extracted using Big Data technologies, and cloud solutions will be an essential partner to this. Cloud software is the only technology capable of handling this data and delivering it where it needs to be in real time. The Internet of Things still has some way to go before we reach this point, but it’s getting there and cloud computing will be driving it every step of the way.